About a year ago I did a blog post and podcast about the absolute best way to protect the valuable personal identity information that’s stored in your credit files. Today I’ll let you know about an update to that, which makes it much easier to take action on this. You can read my last blog post here. But the basic idea of it was this: You should freeze your credit file with each of the 3 main credit bureaus: TransUnion, Experian, and Equifax. There are a variety of benefits to this, but the main one is that a scammer couldn’t use your credit report to create new accounts and steal your good rating. The cost for this was just $10 to freeze your file at each of the bureaus, so $30 total. And that’s $30 per person, so a couple would be $60. And since children have a social security number and other personal information that could be stolen, it would be $30 for each of your kids. Then, if you do apply for a loan or need to have your credit checked for a specific purpose, you could just go in an UNfreeze it temporarily to get that done. But to unfreeze it, the same fees would be paid again. So some consumers just didn’t bother with any of it simply because of the cost. Well, the cost is no longer a factor. 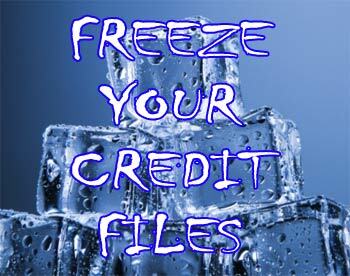 You can now freeze your credit file and that of your dependents, in any state in the US, at no cost. No more $10 charge per bureau, per person, to freeze or lift a freeze from your file. This change came about as part of a new law called the Economic Growth, Regulatory Relief, and Consumer Protection Act, which went into effect on May 24 of this year. If you want to be put to sleep by the actual full text of this law, you can read it here. In addition to eliminating the fees mentioned above, the new law also requires the three bureaus to offer credit monitoring services for free to all active duty military personnel. You can freeze your credit file by phone or by mail, but really the easiest way to do it is online. Just follow the instructions in my last post about this (linked above) but just skip the part about making a payment.